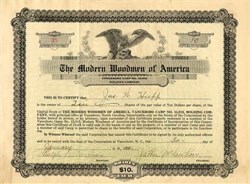 Beautiful lithograph certificate from the Modern Woodmen of America issued in 1920. 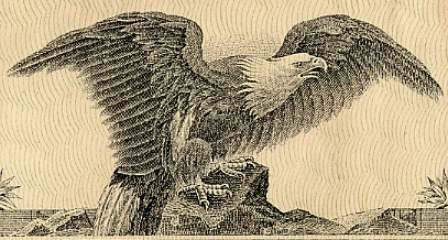 This historic document has an ornate border around it with a vignette of an eagle perched on a rock. This item is hand signed by the Company's President ( Jather McLawhorn ) and Secretary ( Ralph B. Turner ) and is over 84 years old. We have not seen many of these certificates that have been actually issued. The Modern Woodmen of America is a fraternal benefit society organized in 1883 by Joseph Cullen Root. It began as an all male group, but in 1895 organized a women's group, the Royal Neighbors of America, which had existed previously as an unofficial female auxiliary to the Modern Woodmen. The organization and its local groups, called "camps," held social events and carried out benevolent work. Assessments of and benefits to members were an important part of the organization's purpose. The Modern Woodmen of America exists today as a legal reserve fraternal assessment society and the Woodman of the World is a Fraternal Life Insurance Society. The certificate for sale is from the Vanceboro Camp No. 15,913 in North Carolina. Shares were originally sold at $10 per share. Jack Nicholson played a Modern Woodmen of the World Chief Actuary in About Schmidt. Modern Woodmen of the World was also founded by Joseph Cullen Root. The movie followed the life of Warren Schmidt (Nicholson), a recently-retired Chief Actuary for Woodmen of the World who has trouble adjusting to his retirement.